There's nothing like an exhibition to inspire creativity. 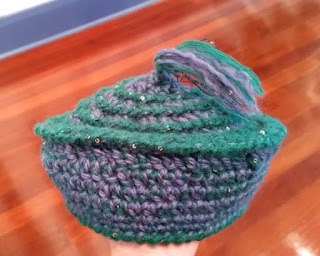 gave plenty of design ideas for crocheted hats. 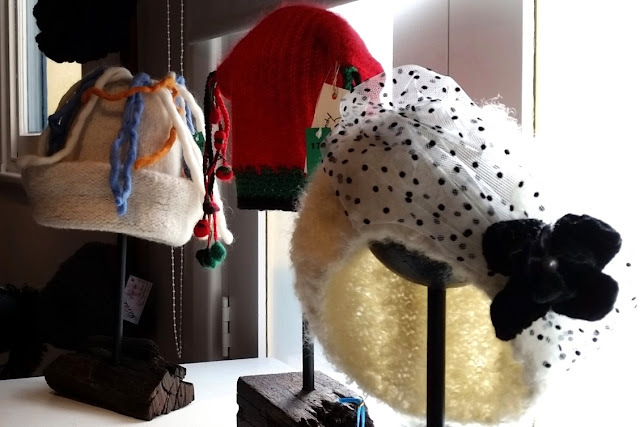 From left to right: knitted and felted handspun wool with 'dreadies' by Alexis Morrison, red mohair jester hat by Sharyn Brady & white hat with polka dot veil and black flower by Kaye Oliver. Let's look at the different finishing techniques on display at 'Beanies to Berets'. It is amazing how a simple embellishment can provide style and character to handmade creations. Fluffy fibres on a top tassel. when you can have a herd of alpacas? 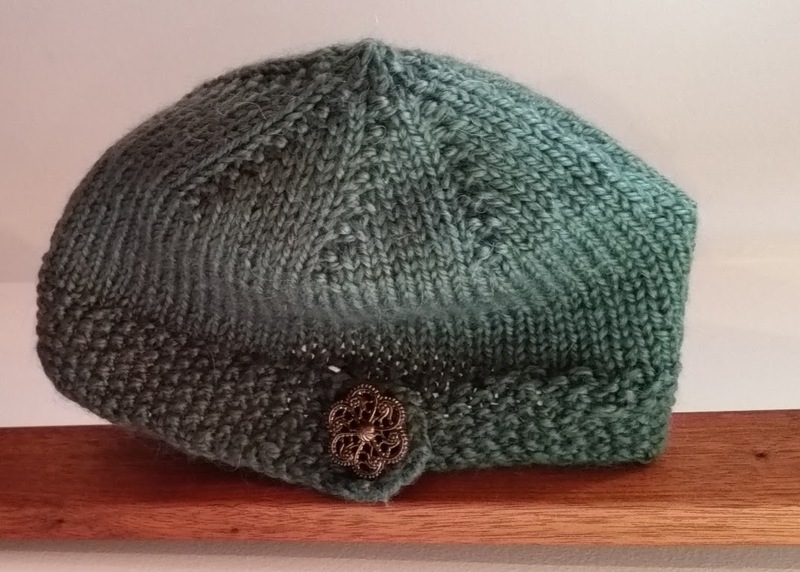 Knitted alpaca hat by Mary Schmidt. 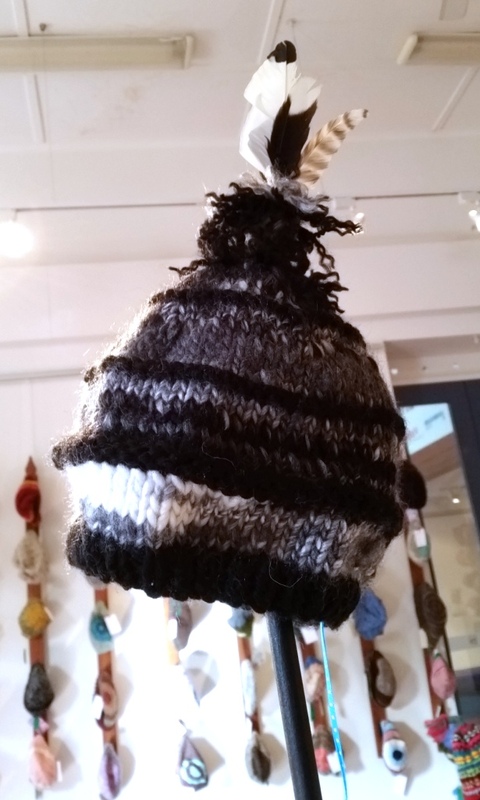 Crocheted hat by Helen Herde. and crocheted by Sandy Soul. Curly tassels complete this knitted hat. Three different ways to top a hat. 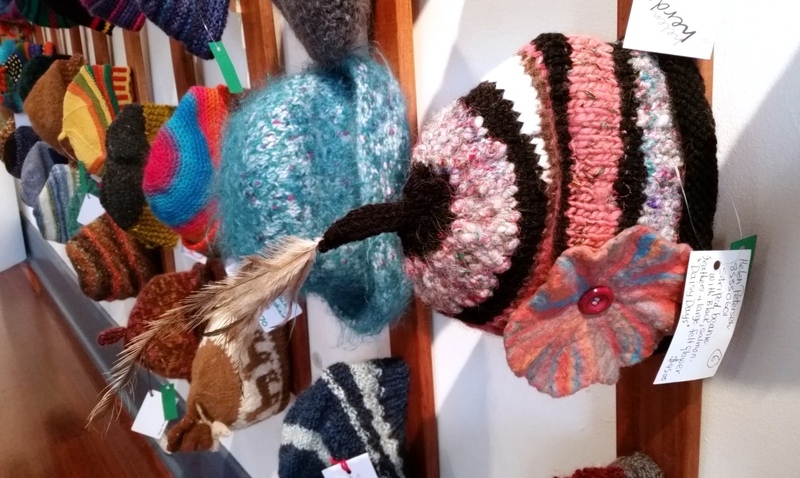 These knitted hats show a felted pom-pom, a cute button and a knitted loop. Why settle for just one addition? 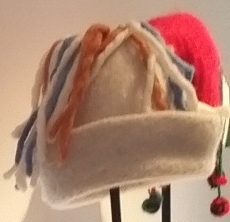 The hat in the foreground has feathers on top and a felted flower buttoned on the side. 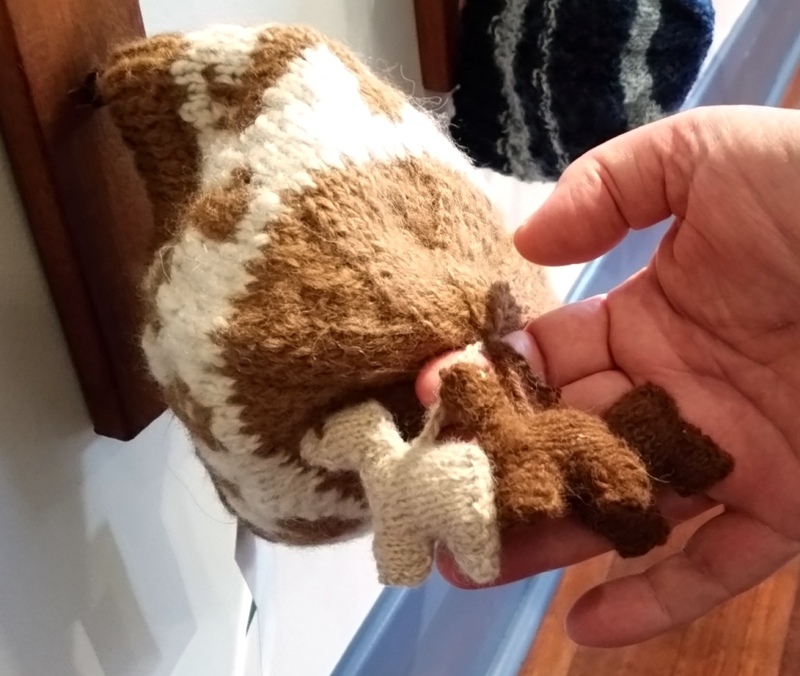 Named "Daisy Days", it is knitted by Helen Peterson. Some tassels look like braids. Flowers, feathers, appliqués, lace, braiding, beading, ribbon, badges and buttons are some of the resources available to embellish headwear. Use them as surface decoration or incorporate them into the fabric and structure of your hat. 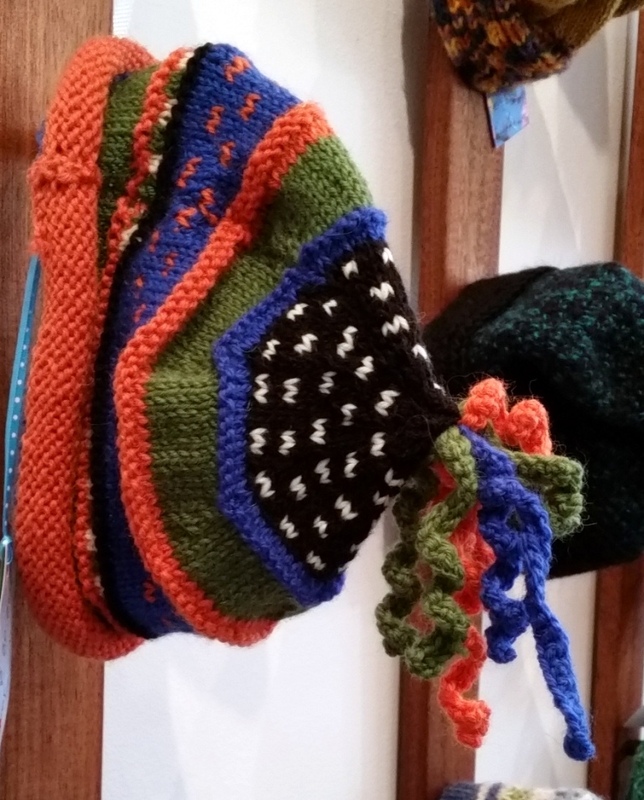 Many of these ideas were displayed at the Beanies to Berets Exhibition. Helen Herde has used bright, shiny beads as accents in the fabric of her crocheted hat. her colourful and textured woven hat. 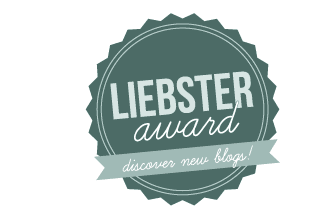 Regular readers of this blog might be aware of my penchant for fringe. #putafringeonit is a favourite hashtag of mine! 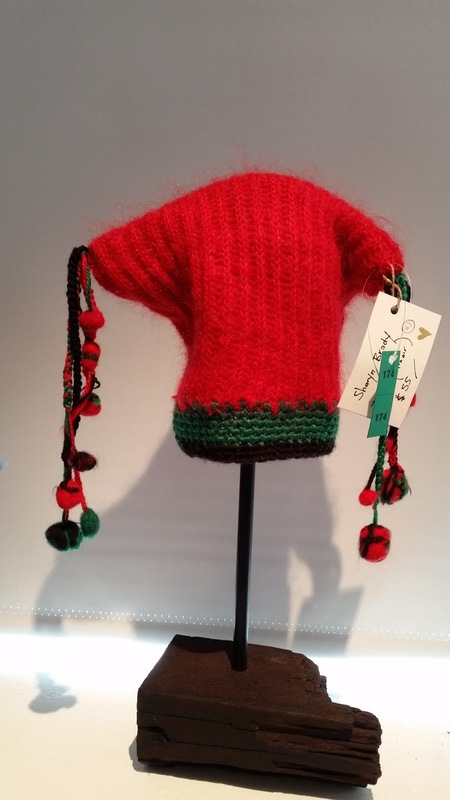 Fringe need not remain reserved for the ends of neck scarves as proven by the beanie makers of this exhibition. 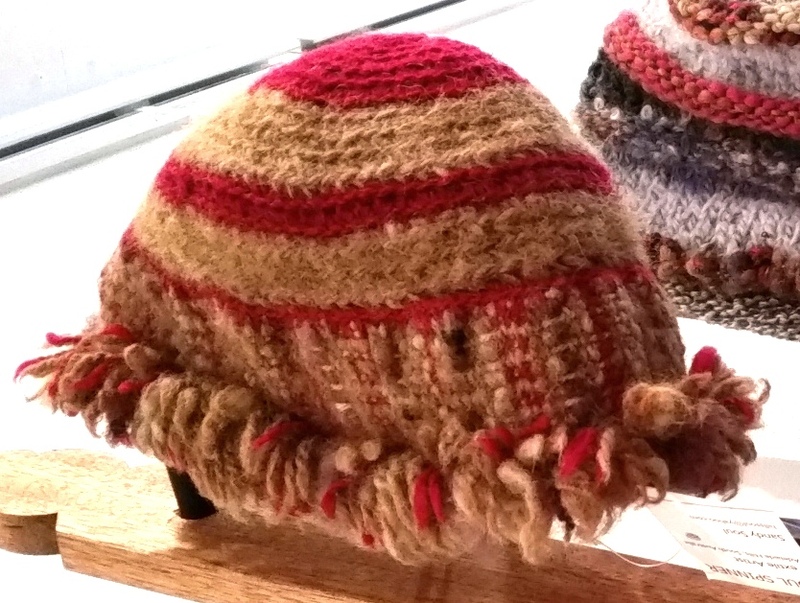 'Mohawk' chunky fringe on a hand-knitted woollen helmet. 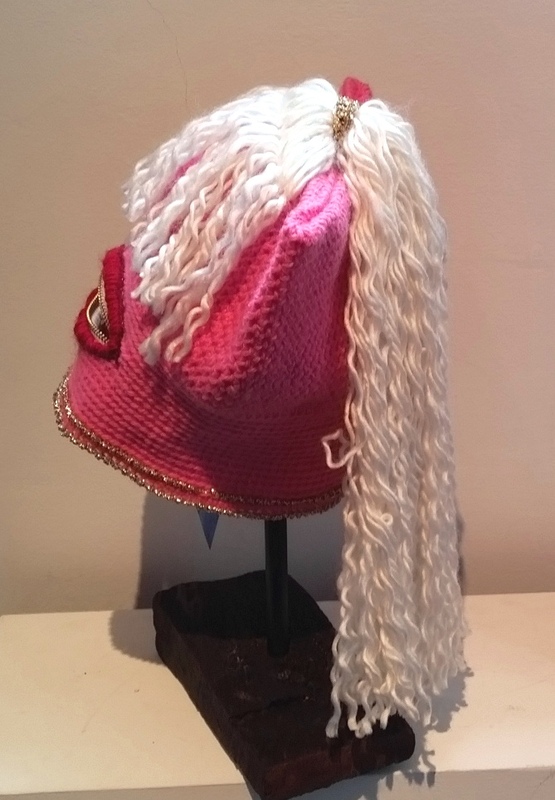 The ultimate use of fringe to great artistic effect was by Helen Herde in her unique interpretation of the iconic "Pussyhat" (original concept pattern by Kat Coyle). I love Helen's wit–zippers for mouths that perhaps should have remained zipped up? It looks like the wearer of the comb-over fringe is biting his tongue. Notice the red lipstick and glittery gold edging–glamour to match the lustrous, long, woollen locks. the back of this "Pussyhat". More information about the Pussyhat Project, including links to free Pussyhat patterns, can be found in the reference list below. 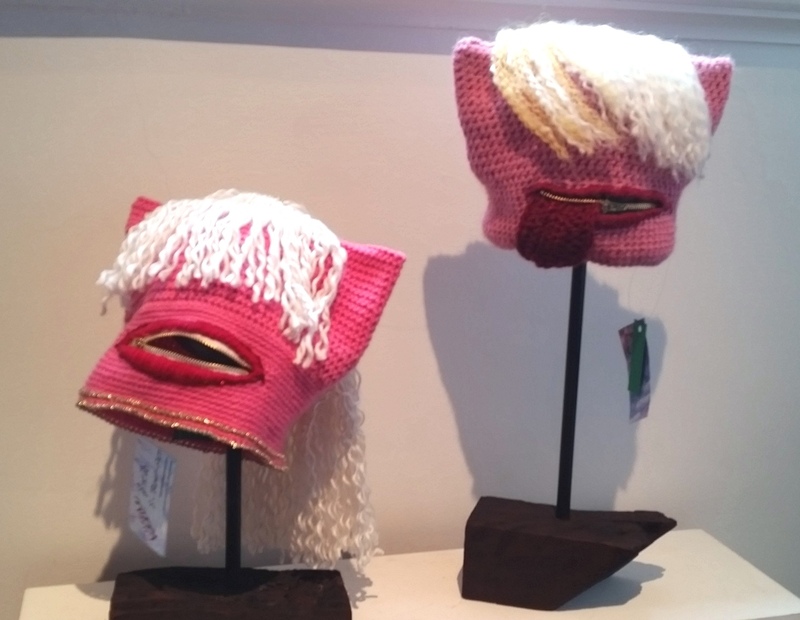 Many thanks to the crew at the Onkaparinga Arts Centre for allowing me to photograph and share the wonderfully eclectic collection of crocheted, knitted, woven and felted hats online. Despite taking careful notes, I ran out of time to note the details of every hat discussed here. I have credited the designers wherever possible and made endeavours to confirm the creators of beanies that have no designer details listed. A list of all the exhibition participants can be found on a previous blog entry, "Beanies to Berets Exhibition & Sale Now Open!" 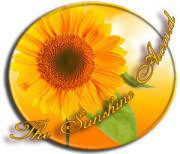 I am in the process of collating further information about each of the designers. It seems that not all of them have an online presence that is easy to find. If you have any further information, it would be most welcome. Please send the details via email to jodiebodiecrochets@gmail.com. 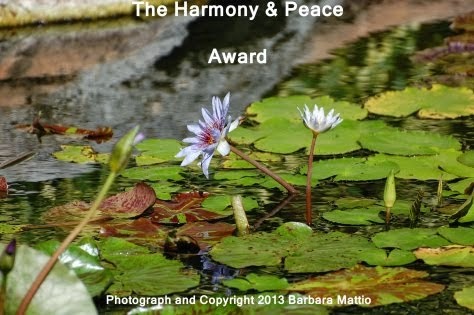 May this blog entry provide ideas and inspiration for turning an ordinary project into something special. 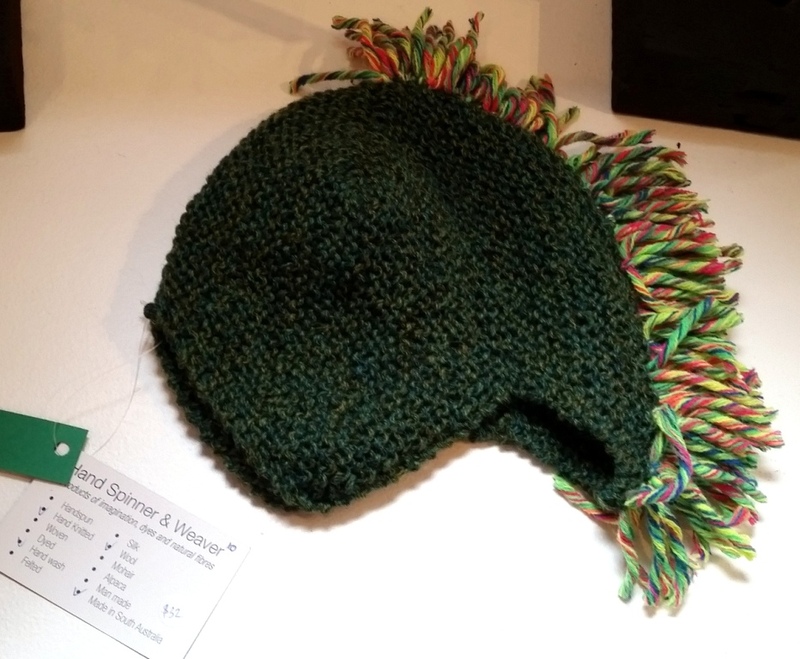 "The pussyhat is a symbol of support and solidarity for women's rights and political resistance." Really wanted to see this and couldn't of course so it is lovely to have some pictures of it! Oh, Cat! I know how much you wanted to see it. If I were able to drive that far, I would've been able to pick you up and take you. As it was, I needed to be taxied myself. There will be a few more pictures to come in a third instalment so you will eventually have three blog posts of pictures to peruse. I love the whimsy and colors of the hats. Great inspiration! Sewing can be daunting. 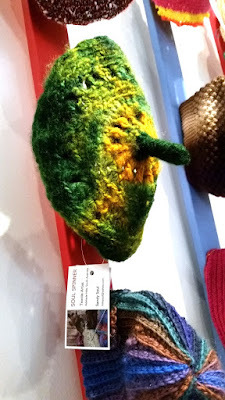 When I first began crocheting, it was a challenge because I had never sewn anything before but slowly, starting with weaving in ends, then whip stitching limbs on amigurumis, gradually the skills build. Help from reputable sources like texts and tutorials was also useful. 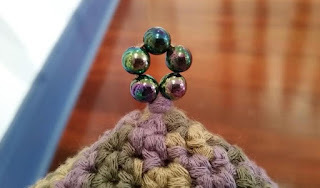 As some of the examples here have shown, we don't necessarily need to sew embellishments on - we can incorporate the decorative elements into our crochet; e.g. 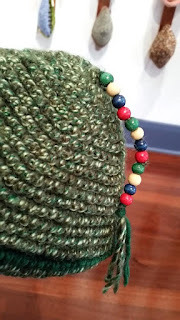 crocheting or knitting with beads (either pre-strung on the yarn or added as you go), leaving the loose ends a bit longer and fluffing out their plies for a tasselled look. Even fringing can be incorporated into the fabric by the use of 'loop stitch' (it may also be known as 'fur stitch'). Nevertheless, I would rather a plain crocheted item, which has regular, neat stitching, a pleasing overall design and suits its purpose (i.e. 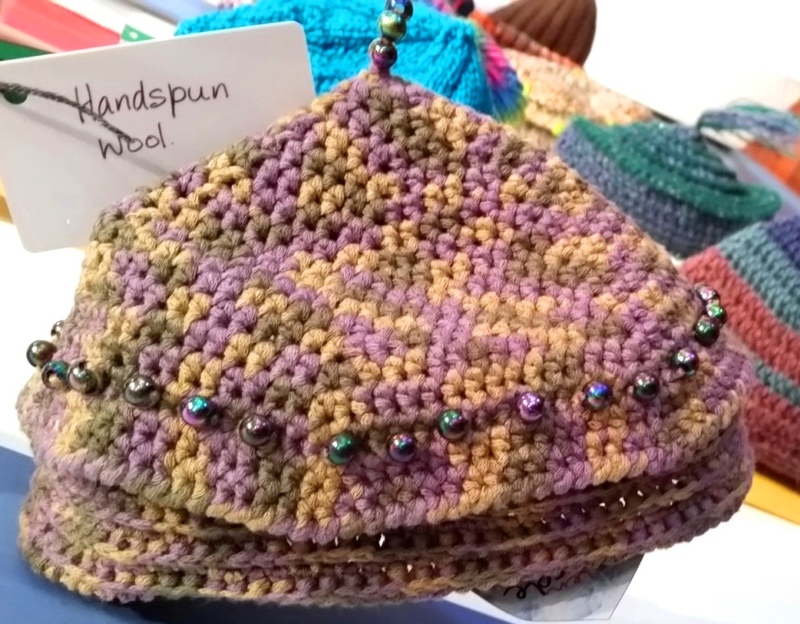 a hat that fits) instead of a multicoloured, extraordinarily creative design that looks amazing but with loose seams and unfinished threads. Whatever the style, good quality work wins my heart every time. They are all fantastic, but I have to admit the alpaca tassels are my favourite. Mine too, and they felt soooooo soft. A pleasure, Helen. 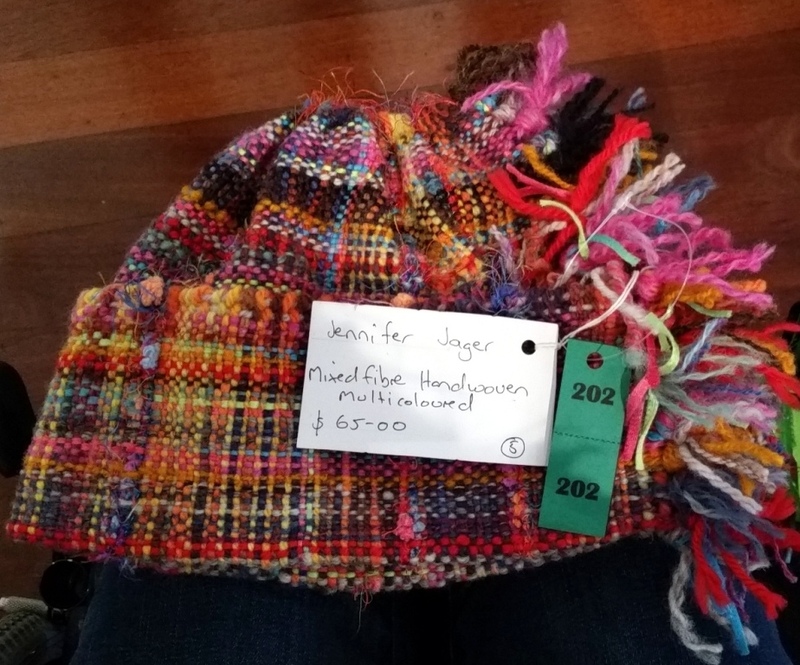 Even if you are not making headwear right now, the ideas here can be translated to other types of projects.